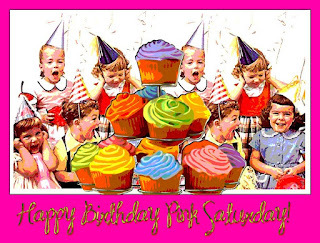 First off, I'm keeping my Birthday Giveaway open over this weekend - so leave a comment here or on my previous Pink Saturday post to win a blog header or a button or blinkie, designed by moi myself! I didn't get a lot of visiting done last weekend, as we were out most of the time, so I obviously didn't get many visitors either... so to be fair, I'm holding the giveaway open this week as well. I know I promised to announce the winner today ... well, it'll be next week instead. This week, I've been frantically busy (invited to teach again at the annual Gerrards Cross Summer School) so Wednesday I was teaching Japanese Stab-bound albums. 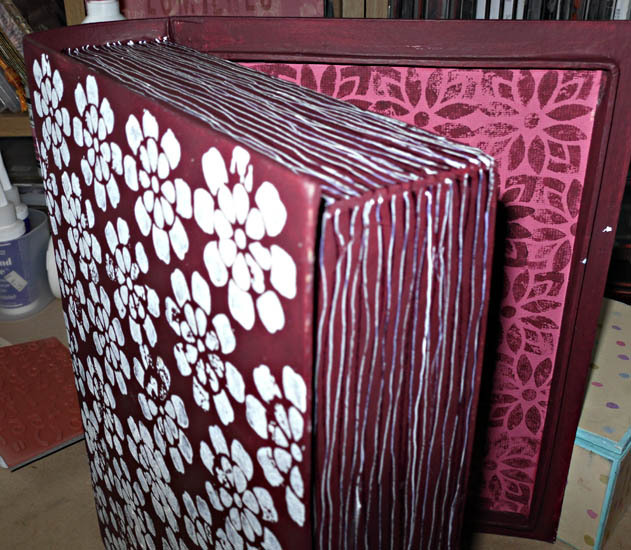 Here are a couple of the books the group made - I had 11 students, but we didn't discover we had a camera in our midst until after a few ladies had already left. So they missed out there. Brilliant, aren't they! 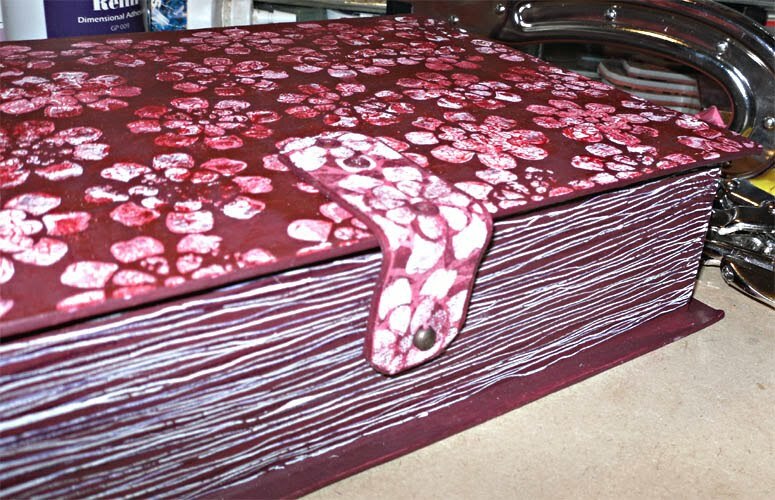 I prepped the box inside and out with burgundy acrylic paint. I lined it with Khadi paper (heavily textured, handmade) in a strong pink which I overstamped with more burgundy paint and my toys: hand carved wooden blocks from Colouricious. 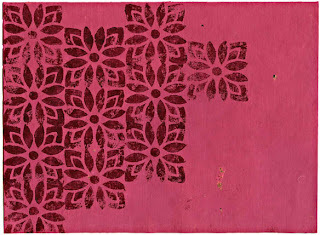 The paint was applied to the block with a sponge brush, and you can see the very simple repeat pattern: from the left, just stamped from top to bottom. 2nd from left, pattern dropped half a repeat down, 3rd from left starting at the top again, etc. Due to the heavy texture of the paper, the pattern didn't stamp perfectly - enhancing the handmade effect. 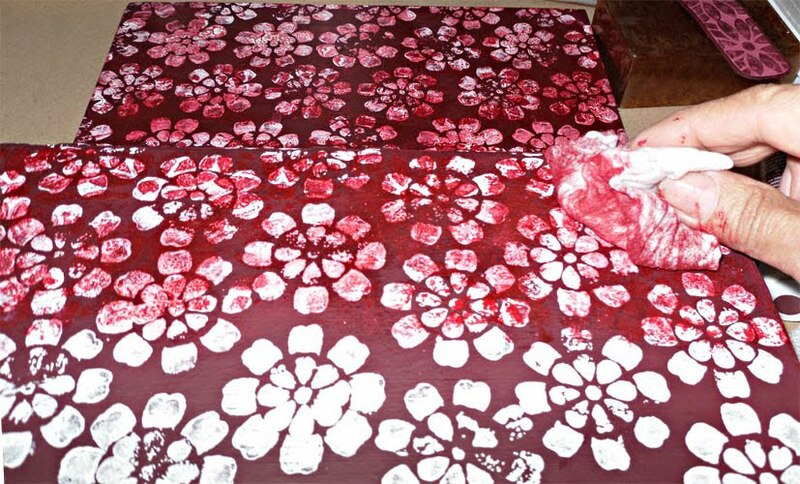 (If you want a perfect repeat, use smooth paper). I sprayed the hinges for my other book green, using the inside of this box to keep the spray away from the table, sorry! If you want to see the book, scroll down to the post before this one. 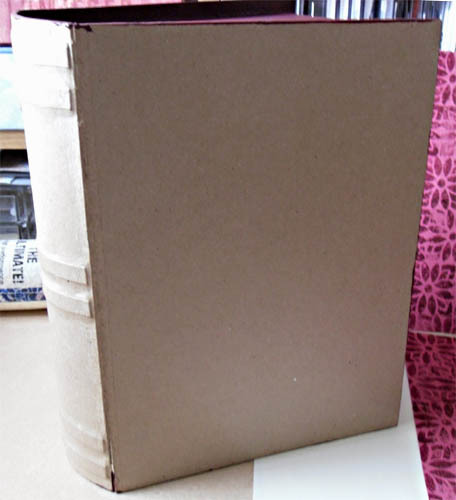 The box is painted inside and out, the small piece is the left side lining paper and the larger ones are for the top and inside the box part - all in one piece, sides and bottom. 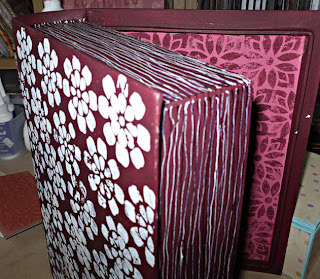 Side paper glued in. You'll notice a slight overlap at the bottom - making sure there are no gaps. 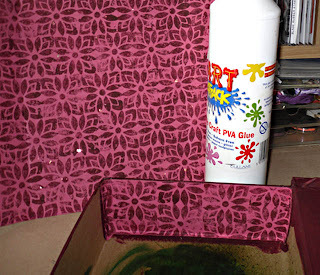 I used ordinary PVA gle (white glue, dries clear). 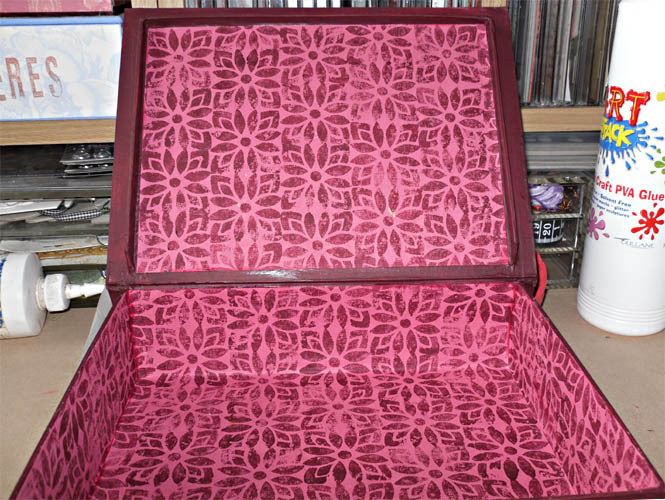 The inside of the finished box. You'll note I didn't glue paper over the hinge as this is a tight-fitting lid. The outside of the box - a different stamp. I used gesso (again, applied with a sponge brush). 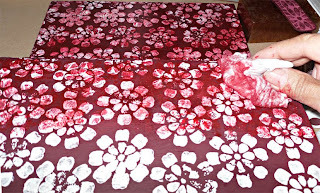 I didn't like the gesso - too stark. 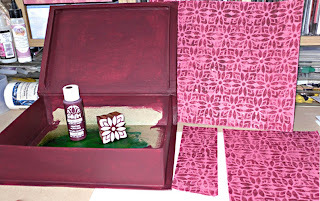 So I overstamped with Lumiere's Crimson (pearlised deep red) using the first block (the one I stamped on the paper for the inside of the box). 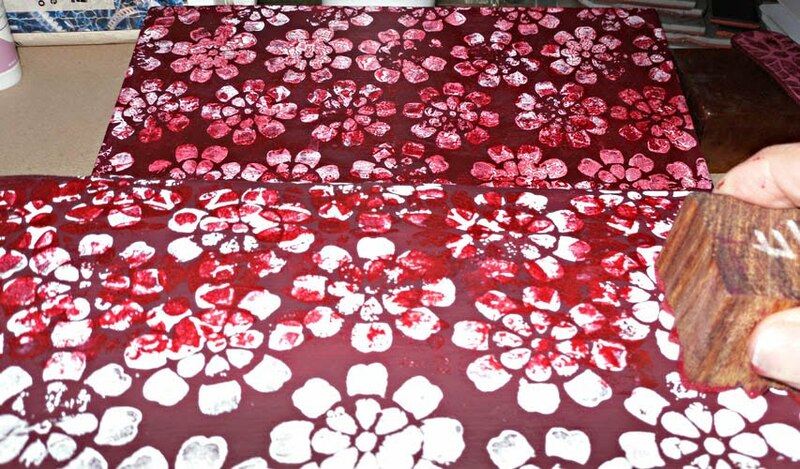 I did two rows of stamping, then blended in with a soft cloth before the acrylic was completely dry. This blended the paint a little, but still left a very dimensional broken texture. 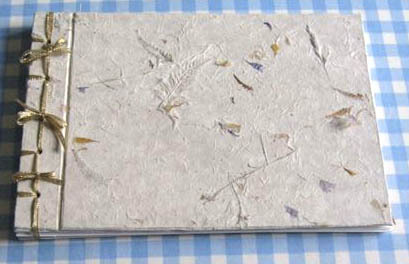 The finished book. Possibly still a little too floral on the cover for my taste, so I'll probably go ahead with some collage at some point. Or maybe it needs some text. Or not. I'll see how I feel in a day or so. Detail of the 'pages' I drew in with a dark grey Copic market. I overdrew with an opaque white pen (Ranger). The fastening is a piece of Grungeboard, cut to size and the corners rounded, then painted and stamped to match. I made two holes right at the top and applied eyelets (too thick to crunch, so I cheated with two sets applied from top and bottom to meet in the middle, with an application of Diamond Glaze glue and a whack with a hammer). This meant there was a little too much movement of the Grungeboard just at the fore edge, so I made another hole and added two more eyelets in the same way (you can see there's an overhanging lip, so that's where I made the hole). To finish the fastening, I punched a large hole at the end of the Grungboard, and a small hole in the side of the box - then screwed in a hitch fastener. The Grungeboard hooks over beautifully. Why bother? I carry the box (and contents) to classes, so this stops everything falling out. Nice, neat and secure - and now a lot more interesting to look at. My Blog of The Week has to be Colouricious's blog - some great techniques and YouTube videos there, especially if you are interested in fabric art. Finally, please visit Beverly at How Sweet the Sound to see all the other wonderful Pink Saturday posts - and don't forget to leave a comment if you want to win that blog header & button! Awesome! 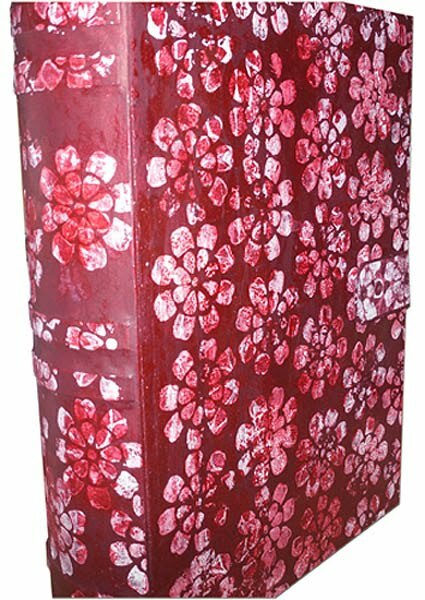 I love the book box. I see them and cannot decide what to do with them! Thanks! Your books are great too! 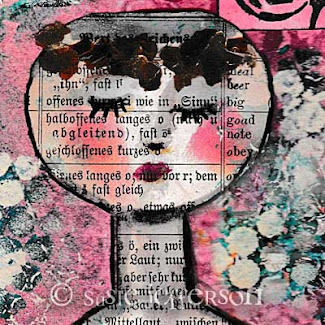 I've just been having a bit of a catch up with your blog, Susie - great fun! 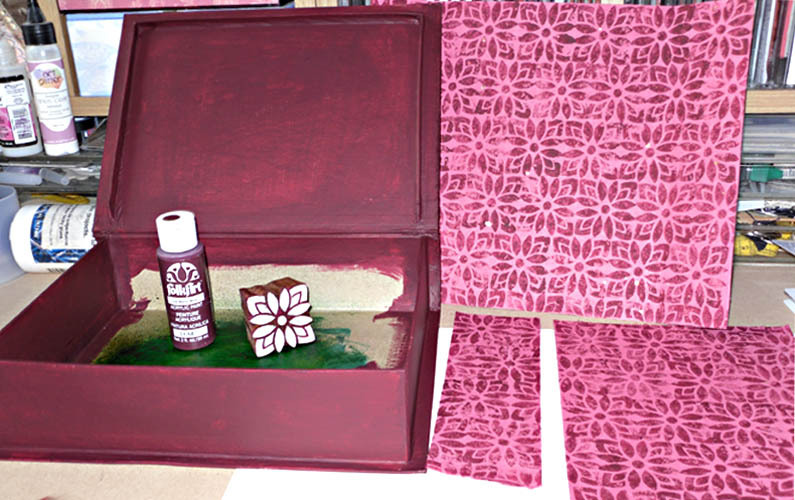 Your book box certainly isn't boring now, it looks great - a lot of work but worth it! Happy Pink Saturday, Susie! Thank you for visiting me! You are ONE VERY TALENTED GAL my friend! Oh my gosh...I'm going back to peruse your site for even more great finds! Happy Pink saturday Susie ! love the books you have made ! I LOVE THIS TUTORIAL AND OH HOW I WISH I HAD YOUR KNOWLEDGE...YOU ARE BEYOND TALENTED. THANK YOU FOR OFFERING SUCH A GENEROUS GIVE AWAY. Another beautiful share today sweetie. I love seeing what you create. You are so talented indeed. 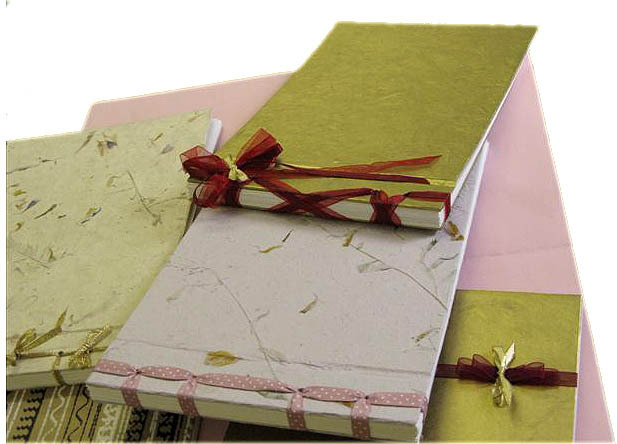 I love the Japanese stab bound albums. They are so beautiful. I will have to research a little on these. I so wish you lived closer, as I can never get in on any of the wonderful classes that folks teach. What fun this looks like. Your book is awesome. Totally awesome. 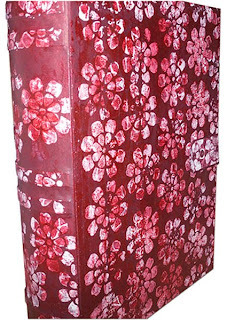 I love the use of a paper mache book box. 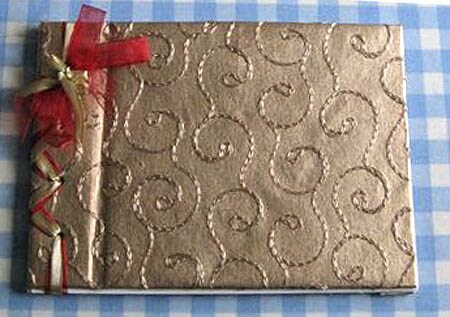 You made it look just like a real book, and I love the closure. You are so creative sweet friend. Love your background! I've got a circus theme too! Happy PS! Someone with you talent and creative mind, I am sure is a great teacher. All your things are so nice. I would love having anything you giveaway. I,also, need that image on your post for my upcoming birthday. Beautiful pink treasures Thank you for sharing..Happy Pink Saturday! I have to check out your utube blog your so generous! It's been a while - life is so busy isn't it Susie? I feel like I've been on the go since Spring - and I have! Africa was so awesome and quickly followed by New England and Canada. Now I'm off to California so just a quick hello to tell you I do stop by even when there's too little time to comment....and always so enjoy your wonderful projects and appreciate you always sharing so much great creative info with us. Hope life is good dear.....I'm missing coming home this year but hope to make it over next Spring! Take care - hugs, Mary. 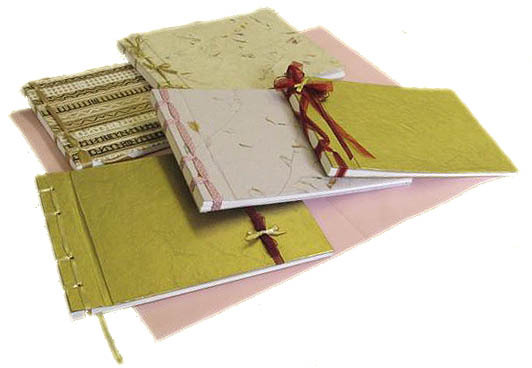 Oh I was going to comment on the wonderful bookbinding class and how I wish I could get to one but then I had a look in your etsy store. Oh such a pretty book! I love what you did! I've got to check your etsy shop to see what's there! Sorry for the late PS visit; yesterday just got away from me! Happy belated Pink Saturday! Happy PS on Sunday, dear Susie! Love your book box ~~ you always make the most creative things! 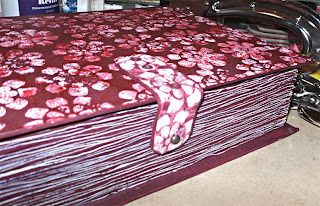 The Japanese stab bound album looks pretty, too! Woo hoo, another chance at the great giveaway! !